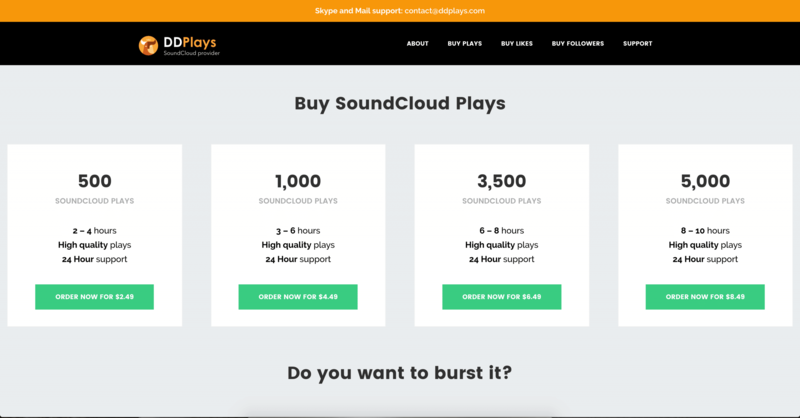 We ordered 3,500 SoundCloud Plays from DDPlays to test their services. They delivered as promised, and fast - on the same day that we ordered them, in fact. They don't have a refund policy to be found on their site, but we contacted customer support (which is pretty responsive and informative) and we found that they do offer a money back guarantee. Overall, we recommend them for all your SoundCloud Play needs. 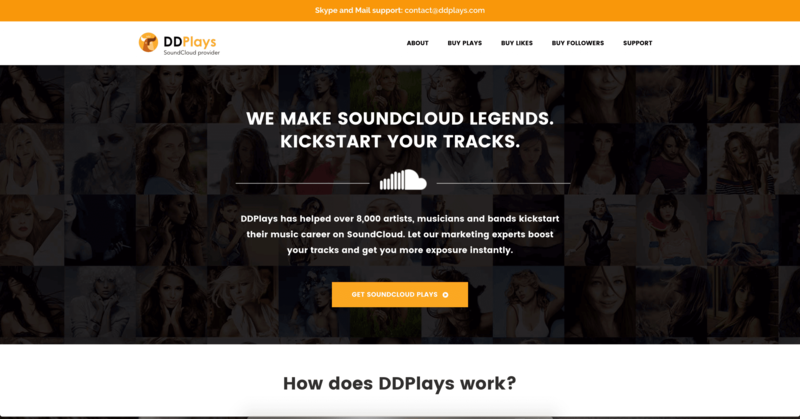 DDPlays is a part of the parent company, DDFamily, which provides marketing services for SoundCloud, YouTube, Facebook and more. Registered in Gloucester, UK, DDPlays offers SoundCloud services like Plays, Likes, and Followers. They have a professional-looking website, and their customer support was top-notch when we contacted them. DDPlays provides Plays, Followers, and Likes for SoundCloud. We reviewed the terms and conditions sections on the DDPlays website and made a few comments on their status below. To find out more details on these, then please toggle the sections to see what we thought! DDPlays does not have a Terms of Service available on their site. DDPlays does not have any Refund Policy mentioned on their site, but we contacted customer support and found that they have a money-back guarantee available on Plays orders of up to 5,000. This company offers no Retention and Replacement Guarantee at the moment. It’s easy to get in touch with DDPlays. Just click the Support link at the top-right of the page. Overall, they responded very quickly and informatively, answering all of our questions in a friendly manner. 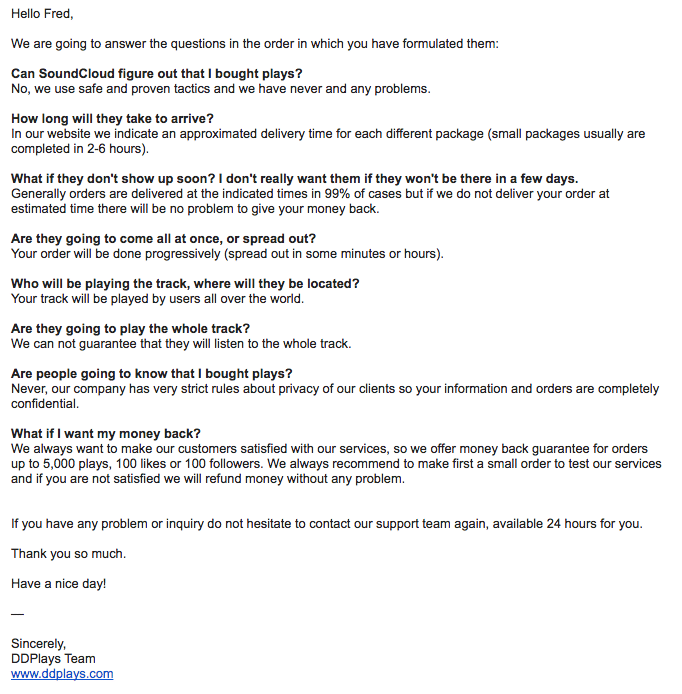 Before ordering, we sent DDPlays a few questions to test their customer support. As you can see, our questions were answered neatly and informatively. The response was also fast, coming in about 45 minutes. "No, we use safe and proven tactics and we have never had any problems." "In our website we indicate an approximated delivery time for each different package (small packages usually are completed in 2-6 hours)." "Generally orders are delivered at the indicated times in 99% of cases but if we do not deliver your order at estimated time there will be no problem to give your money back." "Your order will be done progressively (spread out in some minutes or hours)." "Your track will be played by users all over the world." "We always want to make our customers satisfied with our service, so we offer money back guarantee for orders up to 5,000 plays, 100 likes or 100 followers. We always recommend to make first a small order to test our services and if you are not satisfied we will refund money without any problem." After our order was complete, we once again sent some questions to test how they would respond to a paying customer. Their reply was excellent, answering all of our concerns. "No, do not worry about this. Our plays once they have been sent can not be removed." "We use safe and proven tactics with progressive spread out in some minutes or hours from different worldwide plays. Doing this way the process is much more true and it is almost impossible to know that plays are bought." "Sorry, our prices are relatively low compared to many other social media companies, and this does not allow us to make special discounts." "Yes of course, we also offer likes for your tracks and followers for your SoundCloud account. We will also offer reposts very soon." 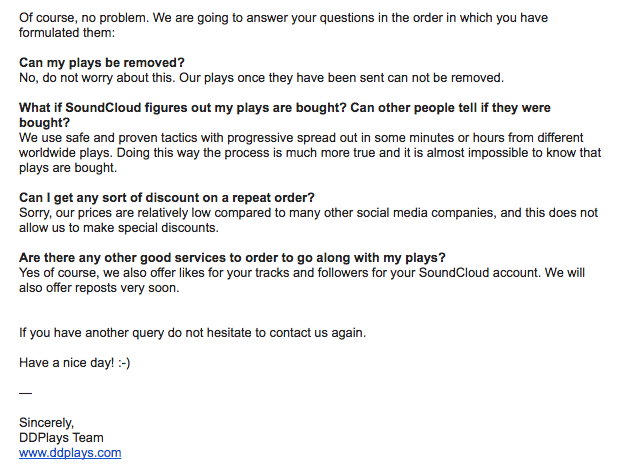 If you want to improve your social proof on SoundCloud by purchasing Plays, DDPlays is there to help. Their services will work well for any musician on the platform. As you can see, DDPlays delivered their Plays very fast. Delivery began and was finished on the same day we placed the order. However, their customer support team is quite responsive and helpful. We talked to them and found out that they do actually have a money-back guarantee, though only on orders of up to 5,000 Plays. Overall, we would recommend DDPlays to musicians looking to improve their social proof and reputation on SoundCloud. After a conversation with the customer support, i found out that they had a money back guarantee. This was enough to help me make the decision to use their service and they didnt disappoint with their delivery. I got my 6000 plays in time. Its my third time using this service and they keep doing the job right every time. The plays arrived in full and in great time. I paid for 5000 plays from ddplays and got them on the same days. I am a happy to report that my soundcloud following has grown ever since getting this plays which are of great quality as well. I am excited about the future seeing the kind of following am getting. This is a great service for upcoming artists or anyone looking to grow their sound cloud following but are on a budget. I got the plays i wanted in a short period of time and my following has increased immensely. You get good quality plays, fast and affordably. The responsive customer support ensured that my questions were well answered and i eventually ordered for 1500 plays which were i got on the same day. They are fast and efficient. ddplays offer their customers exceptional service, at least that is what i got. The customer care rep was polite and answered my queries well allowing me to make an informed decision before making a purchase and in the end i got value for my money. At first, I was sceptical on engaging DDPLAYS after a serious let down by another company almost offering similar services. DDplays results were almost immediate am definitely engaging them in the future for organic views. I received both soundcloud followers, as well as plays. The plays were well distributed and I am pleased with my SoundCloud as it is. The SoundCloud plays I got have really boosted my tracks as an up and coming artist, having not joined SoundCloud till of late. After their plays service over a duration of a month, my tracks are doing better organically than I had thought.